Below are art pieces I drew and colored. These are conceptual art I created in my free time. They helped me through my time of rehabilitation. Hope you enjoy them. Pushed into the world of pastels and pencil crayons. Heart of gold, head of an ox. Infinite is a big number. Forever is a long time. This moment should really be seen as a new beginning not the end. Let it be full of possibilities and gratitude. Love not for the sake of love. Live by reason to allow joy a chance to take it’s roots and flourish. Let fate be what one chooses it to be. Let Karma be a system built on kindness and credit rather than a system of opposite reaction and consequence. The nature of light is to Copy, Clone and Create. The nature of dark is Death, Decay and Destruction. Beyond the scope of Light. And beyond reach of Dark. Be released from the eternal cycle. Break free from the trivial cycle of light and dark. Growth is reflected in the clear water’s surface. A melody that will draw you into infinite darkness. The flow of time is always cruel. The world is consumed by greed. The forest of retained youth. Lost memories of past deeds. A childish mind will turn to noble ambition. Humanity, the small and the weak are worth defending and fighting for no matter how tainted, broken or defected it all may seem to be. Love for this quality is necessary no matter how limited and deviant it may become. We must have hope and faith no matter the worth even when it is holistically depreciated or crooked. It (life) is precious and it must be carefully guided the roots carefully tended. Truth must always be kept in check, the integrity sanctioned and established. Innocence and humanity is always worth fighting for, for the lost must be found in the end no matter the outcome. This humanity is small and sought after no matter how life turns out, the tides of justice come in favor for those who fight for what’s right. Redemption is always given to those who continue to fight. Redeeming qualities weighs more heavily than flaws of man. The brokenness of man and life shines through when times are tough. The cracks act as scars in life and builds the person’s character. This is not the end, this can only be seen as a new beginning. You must be willing to fight, for all you have is what’s in front of you. Because everything just happens to be all you currently see at the moment. All you can do is take what you have at this very moment and make it bloom best you can. The fruition of your work continues to grow forever until termination. And termination is only determined when you decease. That is the value of life, it continues to give (life, hope and happiness) until you give up. Bless all life and forgive all those who fail. For redemption is a quality to all the living no matter it’s current state. I forgive and have love for those who can not give anymore and are deceased. You will live in my heart and I pray my actions in life will redeem those who have given up hope and living backwards. The Dark, The Light and The Better Medium. My original book was based on the idea of how there was light in selfless and unconditional love, it was an idea that stayed true to it’s essence as an innocent inquiry blog book into the crazy world of life, dream, light and knowledge. This soon brought me to the idea of darkness that would be reflected seeing this light. The darkness that brood which became the selfish and conditional love which I came to dwell on specifying what love I should aim for, often putting love on a pedestal and gradually fed into the inability to clench the insatiable world of pure virtually generated fantasy. I soon later stumbled on the untold end dynamics and detailed recount which became the product here. The Better Medium was arrived by coming to the epiphany that is self-worth, maximizing of priority and preferences. I also looked at selfish and unconditional love and finally the 5th selfless and conditional love; these two other worlds were decaying copycats which did not do much but to help map out the field and since the light and dark seemed to be the most liberating to understand. I indulged in a “Netflix” binge one day and came across a very relevant and curious movie called “The Thirteenth Floor”. Which played on the premise of the world is a virtual world, and in it existed the only other world in the multiverse with a virtual world inside of another virtual world. It allowed the person to jack into a world to do their vices knowing this world was virtual but at the cost the person in the virtual world who was a very real functioning person with a life of his own, would lose a couple of hours and no memory of what he has done in that world during the time of his occupancy in the “skin suit”. They knew very well that the people in that virtual world had a very real existence and their relationships and life were not something to mess around with. Life ensued and finally the bar tender a close friend of the genius architect of this artificial world received a letter he was not suppose to read and found our about the virtual world and how he was not real. That nothing in his reality was real, they were just code and there were limitations to their artificial world. The man was able to jack out of the virtual world into the “upper” world where he would get a glimpse of the real world the world of tomorrow as they call it behind glass walls and picket fences. From there I brought myself to a higher understanding to comprehend the place I call the “Crossway” of this existence. “Crossway” is the golden means of life where life can ideally thrive. Such is the distance of the Sun to the Earth and the Moon (it’s tide cycles) is to the Earth to make life habitable, not to forget Jupiter and it’s massive gravity to direct the meteors/space debris from hitting Earth. So as my light is selfless unconditional love, my dark became selfish conditional love. I learned that the Better Medium was arrived by coming to the epiphany that is self-worth, maximizing of priority and preferences. These are the renditions of what my Dark, Light and Better Medium came to be. These were personally rendered on Adobe Photoshop to get a dynamic of the flow and energy found in traditional Yin-Yang. The bleeding and outer rings of these two graphics came out naturally to show the nature of transferred energy red to blue, black and white. This last render (The 2nd) is a 12 or 13th level dynamic graphic. Dynamic in that it was created in a procedural and gradual edits using vectors and pin point accurate rotations of vector programming. Meaning, You cannot merely replicate these graphics unless you proceed in a certain step by step generation of these graphics. Nothing is actually wrong with these two graphics they are in perfect harmony. Any mismatch or slight overlay nudges happened naturally during the erecting process. In my recent dreams, I do not understand if it’s just my mind running like a loose tap but I am starting to see a fluidness of evolving micro to macro worlds as I am lucid dreaming. They call it an awakening but it feels like I’ve touched the edge of what would be deemed sanity at this point. I feel and understand now what it is like to be normal and sane with a small touch of crazy some times but it’s good to know your limits as I’m sure no one “great” has ever thought inside the box for out of the box answers. The more dreams I have, the more vivid the detail, depth and colors seem to become a touch of synesthesia perhaps. Though it seems more like a jumble of mess degrading or evolving mass despite that fact there is a pattern of looking deeper into the worlds within itself. 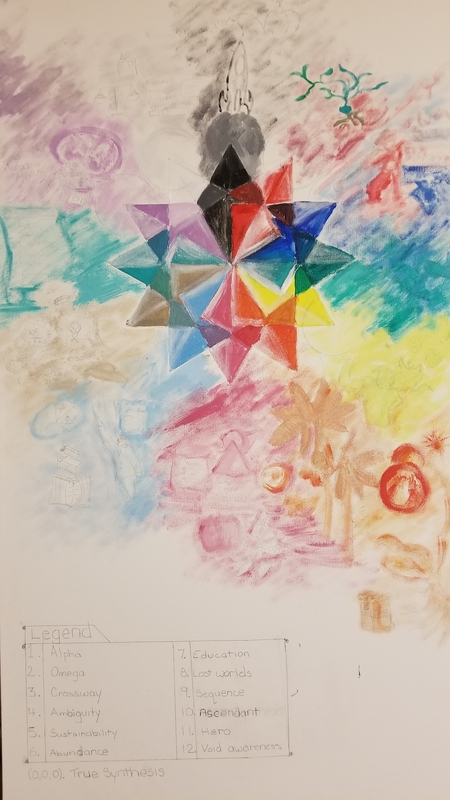 I completed this acrylic rendering of a 3D 12 pointed Merkaba star by hand; for your viewing pleasure with some side notes about the mark up system I used to help define and identify better the nature and direction of this dynamic object. This was done on a 24 inch by 48 inch art canvas and will be up for auction at the Vietnamese benevolence society along side the “Ain Soph Aur” Tree of Life in October. I used a set of systems I have identified as essential for any Independent Biological Ecosystems and that may be compatible for “Universal” Symbiosis. Alpha. Seed of beginnings and roots. Study of harvest and agriculture. Trade and networking. Paths and strong roads. Omega. Finalization, fruition and products. Mature/ripe for capitalizing. Sales marketing business of persuasion and study of capitalizing. Promotional skills in advertising business, manipulation of economics and entrepreneurship education. Minor financing, practical and technical skills. Strong practice and matured development in exposure to cultured independence. Cross-way. Study of all things related to time. Overall energy consumption in relation to resources, worth, power, mass, space, distance and it’s affects towards general progression. Scaling and weighing options. Ambiguity; Study of vice and virtue. Implications and advantages. Sustainability study of Fractal micro and macro worlds. Maximizing and minimizing. Mastery of salvaging. Abundance. Processing/accumulate staple resources and manage excess resources. Education: Providing archives of knowledge, ways to accumulate and promote essential knowledge. To teach, inform and educate. Lost worlds. Opportunity and possibilities. Sequence study of order, principles and priorities. Ascendance; Intelligence spectrum mapping and ways to traverse the world of information and creating applications for further functional efficiency. Hero: Making sure things are legitimate and that integrity has not been breached. General law is weighed and scaled appropriately served and punished accordingly to general justice. Resolving legal disputes. Void Awareness: Differentiating body from space. Limitations and boundaries. (0,0,0) True synthesis; Assessing, establishing and processing the immediate mission and priorities. Declaring all things to be of either priority over preference nature. Tying up bureaucratic loose ends and analyze legal loop holes and exploits of system. Disputes and legal conflicts cleanup. Collaboration and creating data base, archives and true principals through collage of all systems. Alpha, Omega, Crossway, Ambiguity, Sustainability, Abundance, Education, Lost Worlds, Sequence, Ascendant, Hero, Void Awareness, and True Synthesis. Ein Sof Aur is a mysterious tree representing life, experience and knowledge. Another week of reading and studying of the Gene Keys which are derived from the Chinese I Ching. Here are my notes for the 38th and 52nd gene keys the 3rd weekend study. There is a total of 64 Gene Keys and thus we are near the end 12 or so more Gene Keys. Siddhi Honour, Gift Perseverance and Shadow Struggle. For great honor is found in sacrifice of one self and to surrender to competition. To turn the darkness in to an act of light and convert all darkness to become light. Siddhi Liberation, Gift Dynamism and Shadow Provocation. When fear is felt there will be anger based on being trapped. First 7 years of unstructured dynamism of playing is important to a child’s individual growth. Knowledge can be forced, but genius needs to be given a great deal of time and space to organically grow. The greatest warriors know no fear. Siddhi Divine Will, Gift Resolve and Shadow Exhaustion. 40th shadow is one of the most deep-seaed causes of cancerous disease on our planet. Saving energy the gift of saving energy at all levels called wu wei; art of doing nothing. Divine heart, divine mind and divine will. Divine will brings about other two cosmic organs. It is only when everything is taken from you that you feel this emptiness. This experience is a deeply paradoxical state. God can only visit when you are not there. Siddhi Emanation, Gift of Anticipation and Shadow of Fantasy. Atg is the door codon which acts as the entrance to the genetic function. Chasing a fantasy without realizing it producing the result the unending wheel of samsara. The difference between 41st gift and 41 shadow is the the difference between genius and non-genius. This gene key is the ring of origin. Emanation of the Ain soph aur the sephirah of the kabbalah; the model of emanation containing the concept of infinity. Also named he black hole or i-ching “decrease”. All 63 siddhic states are meaningless including bliss, ecstasy and god are meaningless since they are all subtle expressions of the prime emanation. All efforts to induce the state of enlightenment is meaningless because we are helpless to attain this state. One cannot attain enlightenment when they are purposely pursuing it. All is sucked into the vacuum that is the serpent ouroboros – endlessly devouring its own tail. Siddhi Celebration, Gift Detachment and Shadow Expectation. All gene keys start with 3rd Gene Key and ends with 42nd Gene Key. Expectation is the promise of a better tomorrow. To live in the now and do what our heart desires to be happy. It is never too late to live in the now. Postponing until we get old is what we naturally will do if we keep procrastinating. 42 represents death/end of the key and end of a natural cycle thus sends out a notion that time is running out causing a responsive reaction that prompts immediate action. Every seven years we regenerate all the cells in our body thus we have a new body. 42nd key form a complex codon group in DNA that is known as the ring of life and death. Careful with expectation, sometimes you will miss out on the good things when you concentrate on the bad. Detachment allows one to truly grasp the truth of things, not being influenced by the negative or positive. Work with expectation rather than being a victim of it. There is great understanding and freedom when one surrenders deeply to their life. Shadow patterns are in fact an illusion. The explosion of the moment is seen as celebration. You have always been asleep in the siddhic sense. You cannot be half-asleep – you are either awake or sleeping. Thus awakening/sleeping is a occurrence of being in one of the two different states. The occurrence of awakening is not an event, it is the end of all events. We are the serpent shedding our skins. The body is the skin, we are not the skin but we are the serpent endlessly shedding the skin. Celebration is the direct manifestation of true awakening. Siddhi Epiphany, Gift of Insight and Shadow of Deafness. Deafness. Survival, service and surrender. The natural process built into lives of human beings and this process has 3 stages. These bands form the spectrum of human consciousness the 64 keys are built. At the shadow you are operating at genetic survival mode by via frequency of fear. The only certainty in life is change. The white noise is deafening, which makes it rare to see a human being with a clear still aura. Change is not found in pursuit of change, It happens automatously, we pursue happiness in order to change our reality. We cannot escape the mental loop of worrying. The wonder of the human being is unpredictable, spontaneous liquid genius. We praise heroes from afar and at a safe distance. We label those who pursue the rebellious spirit as outsiders outside our bubble. Without regular shaking we become frozen and stagnant. He or she cuts a new pathway without worrying about where it is going. Forgetting the future and simply be the conduit for creative insight by means of simplicity. A relaxed solitude of break through in order to become a more contemplative being. The star and the magi. Buddha experienced a epiphany through his great surrender by means of disappointment searching for something he already had or is. You are what you are and nothing can be taken away from your nature. The only thing you know is that you know absolutely nothing. Nothing you say is of any important or relevance whatsoever. It is like you are sharing a private joke with yourself. Siddhi Synarchy, Gift of Teamwork and Shadow of Interference. Human fractal is ultimately chaos of everything under the virus like master program “that cannot be wrong” in order to eliminate interference patterns. Starting from individuals to the grass root relationships. The ability to smell the indications of a person’s heritage via hormones and pheromones and track back details of their past lives. To be able to race fractal lineage back to the source of all fractals. The Queedom; the complete understanding of the mechanics of human destiny and entire story of humanity. Synarchy; The prefix “syn” of synarchy is to concert and “archy” means to govern bringing in the concept of collective rulership. Centers of the world variously known as Shambhala, Mt. Meru, or Agartha, and from which a secret circle of ascended masters or celestial beings govern the world from a higher place. This is a innocent distortion of the Siddhi of Synarchy. True synarchy is the understanding of human fractals in order to fully comprehend its vast vision. 2 classes of insect hierarchy – Ants and Bees. Old esoteric tradition speak of a great being – The King of the World, sometimes known as Melchizedek or Sanat Kumara – who sits at the centre of all creation and governs all life in our planetary system. Akin to the power of the “Queen Bee” in a synarchy of bees. In a hive, all bees serve the queen and their synarchy is divided into different levels of workers and drones. The Queen symbolically and chemically maintains the focus and direction of all it’s members, if the queen dies, the hive falls into chaos and also dies. Silence is necessary to follow down every fractal line within the cosmos of life. This is in order to see the secrets of human destiny and fractal patterns of time, the tapestry of the fractal lines through the cosmos. When the big bang happened consciousness was seeded into matter in a basic trinary pattern called the “Three Source Codes”. A hierarchy that is circular rather than linear. No one in a synarchy is above anyone else because at all times there is an awareness of the groups inherent oneness, the totality can function as one. Core fractals are what we term enlightened beings or masters. Siddhi of Communion, Gift of Synergy and Shadow of Dominance. Food = money. Collectivity makes better chance for a kill at a hunt. The gathering together around food that our civilization was born. Survival is more ensured when staying in one place, cultivating crops and domesticating animals. Life based on territory as a means of controlling the production and distribution of food was the crucible of our modern societies and nations. Hand in hand with change came another development, that of civilised hierarchy. Tribal groupings multiplied, natural hierarchies developed around network of elders or around a alpha leader. Power is distributed according to other’s needs, such as skills and usefulness, or was inherited through patrimony. Food and territory have been replaced by money and wealth. Modern technologies and infrastructure would allow us to live in a world without hierarchy, this is our utopian dream. We still live in the shadow of Dominance because we still live for ourselves rather than for each other. Tribal thinking dominates over collective thinking and family loyalties far outweigh corporate commitment. From Hierarchy to Heterarchy: Heterarchy is a level of self-organisation that already exists to an extent within many hierarchies. Heterarchy distributes information horizontally oppose to hierarchy which distributes it’s authority vertically. It recognises the need for both individual and group empowerment, so it operates at a far higher frequency than the hierarchical models. The Gift of Synergy requires a leap of faith out of fear-based thinking and control by a single person. It is akin to the ideal at the core of democracy – The decision-making should and must be collective. In the business world synergy and heterarchy want to takes us further into networks where businesses that previously competed now dovetail and cross-pollinate each other, thus moving more energy throughout the whole system. This heterarchical model of business; clients and customers are shared between the various businesses that make up the network. Those who hold positions of power and authority have tot risk giving their authority away. When giving complete authority to another is an act of pure alchemy because when such sacrifice is made to the right group the rewards can be phenomenal. The amount of synergy and goodwill that moves through the human network increases exponentially. This new kind of business is allowed to discover it’s own self-organising intelligence. The gift is interesting in the long term it is this fractal energy of goodwill that has the real power of profitability itself. The goodwill generated reaches outwards in ever-increasing spirals that impact on the world through synchronicity and word of mouth. Ultimately the 45th gift is in the long run more efficient in moving together in synergy rather than waste energy on competition. The End of Money; Bread and Wine, Money and Blood are core of the symbolism of the holy communion. Oneness on the material plane through the transcendence of money. Human beings are the true currency and money is the prime means in order of interacting and opportunity. If you trust in the energy of goodwill above all else, you will alter the way in which money moves in and out of your life. Redistribution of money through the world economy must alter in order to serve a higher purpose. Unconditional giving negates the need for money altogether. The ultimate model of human and divine organisation is the synarchy. Communion represents humanity’s original and completed consciousness. Hierarchy is actually the unfulfilled organising principle that leads to synarchy. When humanity attains communion it discovers that it is organised into a vast fractal pattern of human geometries arranged in human wheels and branches. Synarchy is the overall pattern of humanity operating as one consciousness. Such is Christ and the twelve disciples so is humanity and the fractal families of life. Synarchy is thus an agent of communion since their actions, words, deeds and vison flow directly out into humanity building the Synarchy. Christ is a hub fractal in a sense, a conduit of goodwill who sacrifices himself for the sake of the greater community. As we follow his example we taste the greater body of humanity and enact the mystery of sacred communion in our lives. Synarchy can be likened to the interlinked network of neurons and synapses in the human brain. This is precisely what is happening to humanity right now as frequencies move through the 45th gene key come more into play. We discover higher levels of self-organisation. We are more so discovering these patterns rather than consciously creating them. We are already arranged into a synarchy. It is the gradual process of discovery and is limited by our time-processing brains. Seriousness takes you away from life and love and into issues of control and separation. Just as the 46th gene allows you to enter into the field of ecstasy, the shadow of the 46th shadow demands that you live in the field of agony. Parenting at a low frequency is always involved in conditioning through control, whether conscious or unconscious. We want our children to be happy but don’t know how to be happy ourselves. The freedom and spontaneity of our children is a constant reminder of the depth of our own conditioning and unhappiness. In truth parents have forgotten how to play in return for a world of seriousness. We only display ignorance when we are too serious about our lives. We tend to not trust life and try to take conscious control of the events that happen to us. This ignorance prevents us from enjoying the fruits of the 46th gift. Repressed nature of being Frigid often cold and frozen they are stale because they don’t truly accept themselves physically. It requires a step back and a better self reflection of who we truly are. Reactive nature of being Frivolous; Frivolity is an over-reaction to seriousness. Once the façade of being laid back, light hearted and jovial is broken they may reveal how deadly seriously they actually take life. Most frivolous people run away from truth and such people usually reflect this in their relationships; generally short lived and numerous. Acceptance; In order to accept something about yourself, you first have to come out of your own ignorance and own it. Acceptance equals ownership, which leads to Delight. This brings the appreciation of richness to be alive. As you go through life more light hearted; no matter the circumstances you can accept and recognise these instances as being a part of grace. Luck is what happens when you stop interfering with life. The germ of material success and failure is self-acceptance. When you move through life freely with an attitude of delight and openness. Where whatever happens is correct, whether you can see why it is or not is not important. At a active a gift level you will rethink all standard definition of success and failure. Delight invokes grace, stop being so serious. Genetic memory in our blood, referred to as non coding DNA/junk DNA. Accounts for 98% of our genome. The reason that science cannot decode the 47th shadow is because history is not linear but random, and random patterns cannot be solved through logical methods. Random patterns can only be resolved or read by fractal geometry which reads chaotic patterns using holistic laws. All humans individually carry the entire evolutionary memory of humanity within their body. This also means that we are unconsciously driven by this memory in our blood/DNA. Accessing this unconsciousness actually means they are accessing their collective unconsciousness. This access, if not mentally or spiritually prepared can lead one to become deeply disturbed or delusional. The only language that can comprehend/decipher this world is the language of archetypes, namely the language used by Jungian psychology, the arcane symbolism of the alchemists or the ancient totemic language of the shaman. The language of archetypes, which is what the 64 Gene Keys are based upon, allows us to look into the hidden side of our nature, to step into the perilous shamanic underworld of the collective unconscious without becoming personally identified with what we see there. Your suffering is a magic mirror – yours to own, appreciate and accept. Only when you stop trying to avoid it can it show you it’s magic. Alchemy is the natural destiny of human beings. The way is to embrace your fears and surrender to your suffering and problems. Hold nothing back sift through individual problems and embrace everything. Unio mystica or sacred marriage where all your constituent elements dissolve back into another and forms symbolic gold. Requires divine grace hand in hand with siddhi of transfiguration. Siddhi of Wisdom, Gift of Resourcefulness and Shadow of Inadequacy. Darkest gene key of inadequacy. Knowledge becomes wisdom (higher counter part). But knowledge can become addiction to knowledge, a distraction and false security. Trust life on a broader scale and some of the secrets of the well is revealed. Lower the bucket into the dark to have emerge a sense of resourcefulness. The wonder of how much light is found in a place so dark. You must remain open to fear unreactive, vulnerable and unknowing. You must simply sit with it; neither repress nor react to your fear. The feeling of intense bliss is no different than lust or even physical pain. The view of right and wrong. The spirit that enables killing is tribalism hunting and gathering in order to survive. One can justify going to war and kill another based on the idea that they are in the right and the other wrong. Reactions cannot occur without a relationship. The fuel of reaction is the fear of rejection. Intolerance leads to reaction and vice versa b/c we cannot handle the amplitude of our emotional fear when it is triggered by another. We see a remarkable phenomenon the merging of the collective view with the tribal view. 49th and 55th siddhi create the rebirth of freedom, or freedom of rebirth. There must be a destruction of the old world for a new one. 49th siddhi is the gift of revolution to recreate and rebirth or rebuilding the world. 49th gift is in charge of disassembling and reassembling the world. Penetrance genes of the mutation codon relating to the 49th and 55th siddhis will be profound and behavioural patterns will shift dramatically. The cosmos (cosmic order) or cauldron chemical bridge ring of the illuminati. Corruption is merely the by-product of a deeply flawed worldview, and until the core problem hierarchy itself is tackled, corruption will and must continue to flourish. Just like cooks they can balance the recipe without consciously trying. Heterarchy is based upon the principle that if an individual is not in balance then the group has no chance of finding balance. Heterachy therefore requires individual equilibrium before all else. Harmony is constant and infinite whereas equilibrium can be lost. The cauldron is the symbol of the vessel that receives higher consciousness into itself. All imbalances must be destroyed in order that the cauldron of the physical body become a vacuum. Within the DNA of the human being the body becomes a deep resonant chamber for the highest universal frequencies. Allowing the dissolve the body itself so that the true cauldron is experienced as the universe. Siddhi of Awakening, Gift of Initiative and Shadow of Agitation. Competitive nature in humans and the lack of fear of death is what desensitises human beings. 51st shadow is about being first not in order to better yourself but to feel superior to others. All those at the top of hierarchy throughout history are eventually humbled by death. It is a battle with your own fears unlike 38 and 39th gifts of the warrior. It does not involve honour and struggle but more with a leap. The leap into the 51st Gift is the leap into the higher self. 51st gift is about harnessing your difference from others rather than trying to beat someone else at their own game. You unlock the magical force of genius that belongs to you in order to take your own initiative and disregard everything you have ever learned or heard. Two types of consciousness, awakened and asleep. It is not possible to influence this mutation of awakening because it has nothing to do with your experience or behavior. No amount of meditation or spiritual practise can bring about this mutation. The secrets of initiation or every penetration is a sense of shock and results in a mutation or transformation of some kind. Death itself is the transformation of one form back into its constituent forms. Awakening is a surprise; it comes once and only once and after it has come, it stays forever. Siddhi of Stillness, Gift of Restraint and Shadow of Stress. The collective or extended phenotype of humanity is shaped by fear, which creates an environment that puts the physical organism under great stress. In order to escape this collective programming field you are required to rise above it at an energetic level. Rising above the state of stress permanently is very rare. Anchoring yourself into a higher frequency, the same life can be experienced as though you were living in an entirely different world. Reactive nature of restlessness those who consistently secrete adrenaline into the body actually causes great damage over time. Thus such people burn themselves out in life. By confronting and embracing these fears that makes one restless, drives them – they will gradually erode it’s hold over them and learn to activate their Gift of Restraint. The gift is about striking a balance between two extremes of energy; energy of activity and passivity. Ask the question how may I be the greatest service to humanity? Then you must live the answer; The power of restraint allows your life to unfold without urgent demand. It must be allowed to grow and expand in an organic fashion. The gift of restraint is about non-interference. There will be times when you will feel deeply restrained. The acceptance of this restraint and it’s manifestation as patience is truly a powerful gift. Frequency is the oscillation of energy waves at different speeds and intervals. Energy waves oscillating at lower and lower frequencies would eventually stop altogether and you would experience nothingness. At the other end of the spectrum, energy waves vibrating at higher and higher frequencies eventually become so close together that they merge to create another kind of nothingness. And nothingness represents the siddhi state. Bliss or universal love or in this case 52nd siddhi of stillness. 52nd and 58th mirror one of the great universal concepts of geometry and physics the torus. It lies in the center of all space-time. The yin-yang black and white hole sucking and releasing space-time. It creates and expands all energy and matter outwards to create space-time itelse. The Torus at the heart of all being is directly experience though the state of enlightenment, which unites stillness (the black hole) with bliss (the white hole). The moment of stillness and bliss is derived from higher functioning of your genetics. The human endocrine is an alchemical factory in which chemicals and hormones are combined and created. 52nd gene key is a archetype and concerns the unfolding of intention into individual destiny through service. It is the seed of great new beginning and original intention and dream of mankind to realise our position as the still point at the heart of creation. Slows down perceived time at subatomic level in the vicinity of experienced space-time, changing the way in which all human emotions operate. Present moment life, consciousness of the moment. In all that is good as we find the multiverse and connect with our other selves. God will follow. The need for our new seed. Face the shadows of my existence, the doppelganger that impedes the reality of my own true happiness. Placebo: the pill that heals despite no actual content. No-cebo: the pill we take which has no medicinal content only that of negative thoughts but affects the body. Root of suffering: I am not my body. I am not my mind. Sabotage of the mind and resistance to change is your greatest enemy. In order to continue one must surrender to the condition of life. Fear acronym is: Feeling, Excited and Ready. Choose acceptance and the stream of life. Follow the flux of time and adapt to change. Change is indefinite. Do not seek object ive desire and achieving each goal based on desire. No desire chasing only fulfillment. The abundance of finite mind and body. Not finite desires but only gratitude of all that is life. Judgement is separation, inclusion and difference. Every judgement ends in “just like me” because the secret in neutralizing judgement is stating a judgement only to end with “just like me”. Feel deeply forgiveness and direct emotions to forgive the actions in man even if we do not believe what he is even if we do not condone his mistakes and who he is. I am pure and innocent, you are spirit. and you are released from what I projected on you. The monkey mind thinks too much. You are not the parrot, you become the awareness of the person with the parrot. The thought process is the parrot. The crazy uncle instance: Love the uncle do not care or contribute to his insanity. Be a loving presence. Space of no mind and pure consciousness. The moment is now. It is only me that impedes my journey of success. Human experience to play pain and pleasure. The exploration of who we are, the divine journey to discover self and unfold the divine universe. Everything is energy, invisible fields found in all that is energy. Energy is found even in matter. The entanglement of the universes through invisible fields is found in fields of information from the divine consciousness. The power of creation where all compositing fields, the source of creation turn your direction inward. The cosmic internet of understanding at the center of our existence. The law of attraction. Creating your reality and manifesting our fate and destiny. The harmony of crystallization/manifestation of vibration of good and the desire for good things in life. Reality is formed by you and the law of the heart (love). We are co-creators of this reality and responsible for it. We are one and a force of strength complimenting each other; for I can so thus everyone can. tarot cards and numerology. Awake in the dream.